Huntsville Alabama is the place where I was educated in optics, which started my engineering career. Now I came back as an artist, showing optical effects on painting surfaces. Great thanks to Laura Smith and Huntsville Museum of Art for organizing my workshop and thanks to all the artists for coming. This is my first demo. It is still available. For this demo, I did a low key floral painting. I have not done this kind for a while. For the pink rose, the light part is just empty canvas. I have never done that before. This is the second demo. What is that thingy in the right? I am not very sure. It could be an opium pipe. I saw so many antiques in Anita's house. I surely enjoyed painting some of them. Dahlonega GA is a small town about 50 miles northeast of Atlanta. My workshop was in a studio called the Art Loft. I want to thank Anita Elder for organizing my workshop and thanks to all the artists for attending. This is my first demonstration. This is my last demo in Tucson. High key with flowers. So far I still feel I have not really got what I want. Well, I will keep trying. I found this gismo by accident and fell in love with it. However, paint it as a demo right in front of students was a challenge. I love the intricate mechanical structures. It was fun of painting something which was used to paint. 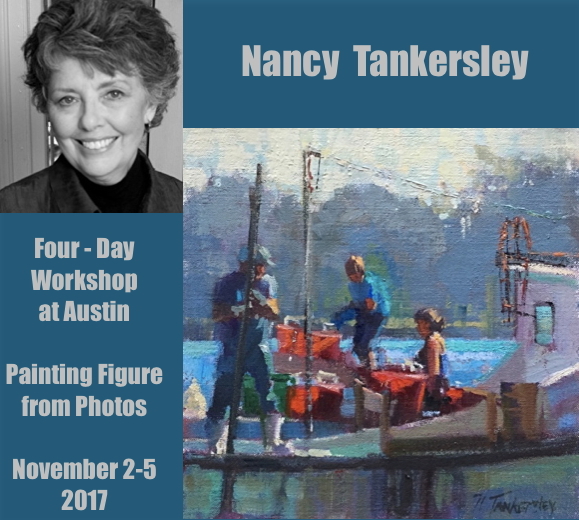 I am so happy to let you know that Nancy Tankersley is coming back to Austin this November and teach a 4-day workshop on painting figure from photos. Nancy is a nationally well known and very accomplished artist. Her expressive Impressionistic colors and bold brush strokes create phenomenally strong paintings, and brought her multiple rewards for many years. Nancy is also a wonderful art teacher. Her instructions are informative and practical. If you are interested attending her workshop, please check: http://www.qh-art.com/nancy-tankersley-2017-workshop.html to get detailed info and sign up. Thank you. After I left Scottsdale, I arrived at Tucson immediately. I want to thank Linda Ahearn of the Toscana Studio and Gallery for organizing my Tucson workshop, and thanks to all artists for attending this workshop. This is my first demo. This one is a little tighter than the previous demo. Painting the coffee grander and the copper tea pot was very enjoyable. Adding folds on the white table cloth made more fun.